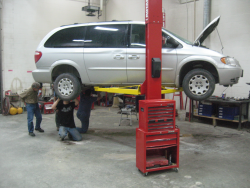 Currently, a significant shortage of automotive technicians exists in our country. These jobs pay well above the average income level, and require only two years of college to qualify for. 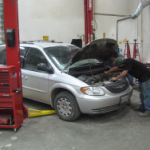 In the two-year program at the St. John Valley Technology Center, students are taught the basic skills required to work safely and efficiently in a modern automotive repair facility. 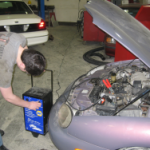 Students are exposed to all areas of automotive repair, with increased emphasis placed in areas of certification. Students will be prepared for their first year in an automotives program at a community college, and will be taught sufficient skills to work as an entry-level technician. “Live work” projects from local customers and placement in automotive internship settings give students challenging experience and valuable exposure to the automotives field. We pride ourselves on maintaining an automotives lab that contains modern equipment, thus ensuring that students are prepared to work with the technologies they will encounter in both college and industry. Students who successfully complete both years of the Automotive Technologies program will earn either 7 credits toward Central Maine Community College’s Automotive Technologies program, or 5 credits toward Washington County Community College’s program, depending on which college students choose to attend. Students can also earn various ASE certifications through our program.